Intuitive Mobile Apps for Restaurants that is Affordable, Scalable & Fully Customizable. Get orders and different reports along with internal order processing done through the mobile app. Delivery Address Management: Save your address for the first time and use it in future as well. Customer can manage their saved addresses easily. Discount Coupon : Generate discount coupons to reduce prices when ordering food online.This can be fixed or in some percentage. 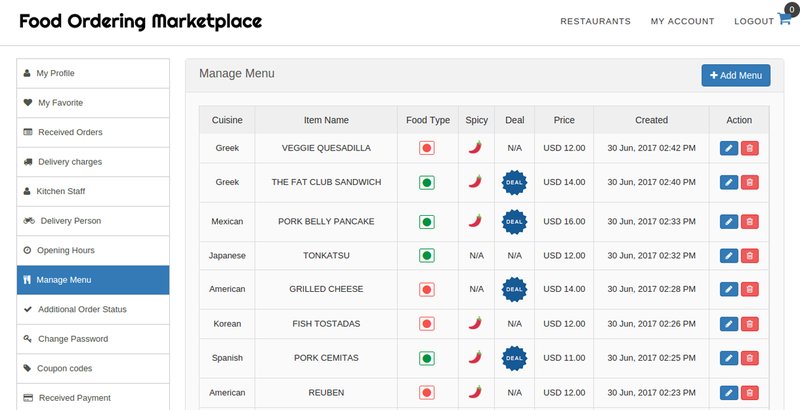 Restaurant Menu Builder : Create an attractive restaurant menu organized in categories. Add Multiple Dishes : Add dishes with details, speciality and more. Payment Integration : Restaurant can receive payment using paypal, credit or debit card or cash on delivery. Pickup & Delivery : User can either pick up their order by own or can be delivered through restaurant. 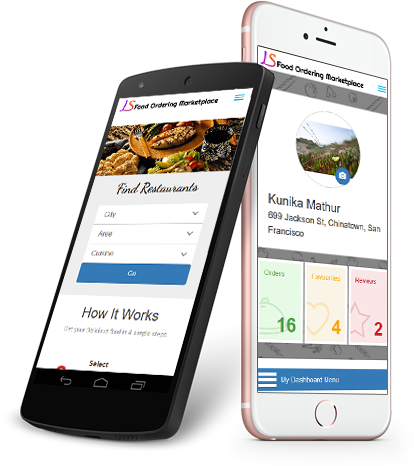 Using our food ordering script, restaurant owners will be able to list their menu, manage orders, kitchen staff, coupon code and payment option. Customers can search restaurant on the app by filtering category. You can also request for customization in our script. Customers can view order details like order number, restaurant name, status and placed date or time. 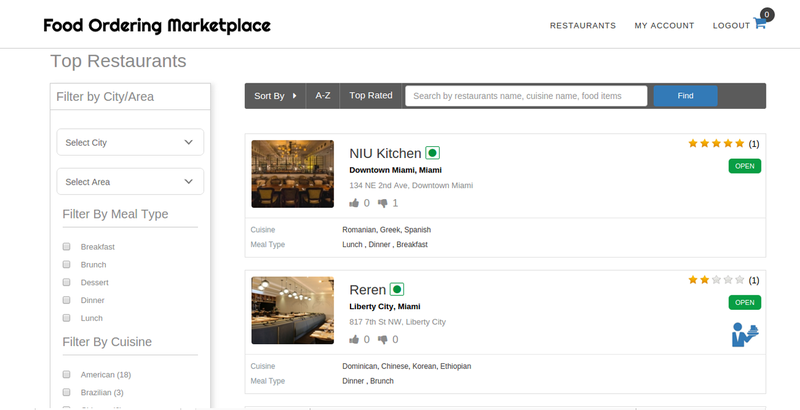 Customers can search any restaurant by restaurants name, cuisine name, food item etc. Customer can view resultant list of restaurants over the site according to the search criteria they have entered. 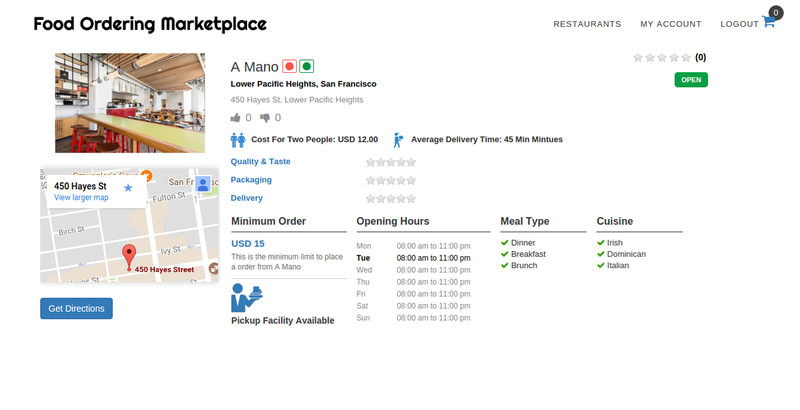 Customers can view restaurant details of the selected restaurant like restaurant name, Image, ratings, minimum order. 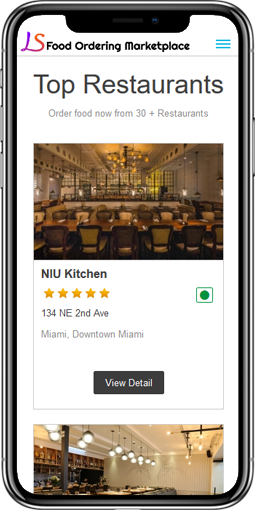 Customer can view the reviews & ratings of Restaurants which they have received from past Customers & will help customer to find the best restaurant. Customer can view account and edit account. Customer can pay for the purchased items by paying safely through an integrated payment gateway. Customers can mark the food items they like as their favorites so that they can see them in their favorites list. Customers can save their delivery addresses. Ordering again, they will be offered to select the previous address. Customer can choose a cuisine to view the food items that are available within & sort the food items by price & most loved. Customer can manage cart by using added item and order them. Restaurants can view account and edit account. 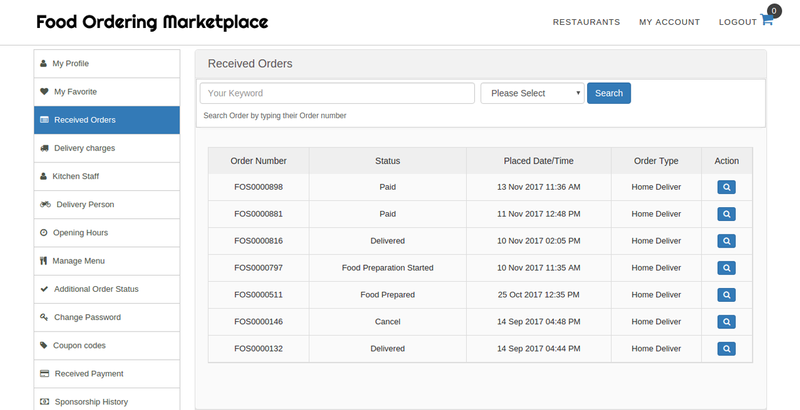 Restaurants can view the orders details like Order no., Order Status, Placed Date/Time, Order type. Restaurant can add new kitchen staff, edit kitchen staff details, delete kitchen staff details and can activate or deactivate them. Restaurant can add new delivery person, edit delivery person details, delete them and activate or deactivate them. Restaurant can view the Order status which will keep track of order's like order is delivered or not. Restaurant can manage the status(Online/Off-line for specific hours) of Restaurant's Opening Hours. Restaurant will not accept any order when status is "Off-line". Restaurant can view membership payment history like transaction id, plan, amount, date and time. Restaurant can view the ratings provided by Customer & Restaurant can reply over the reviews. Restaurant are not allowed to delete the reviews. Can view all the restaurants and its details. Admin will be able to view list of all the Restaurants & can manage(add/edit/delete) all Restaurants. Admin can manage all banners from backend and can add/edit/delete banners details and can acivate or deactivate banners. 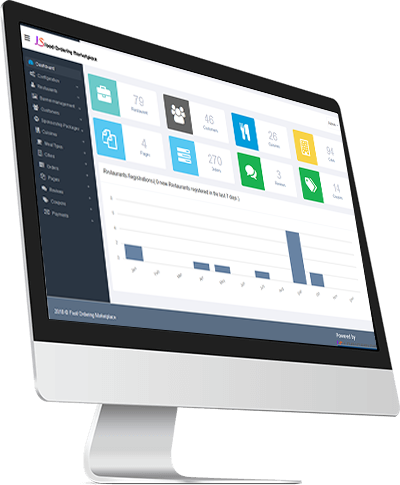 Admin can manage all customers at one place which includes adding, editing and deleting them and activate or deactivate them. Admin can manage all cuisines at one place which includes adding, editing, deleting them and activate or deactivate them. Admin can manage all Meal types at one place which includes adding, editing, deleting them and activate or deactivate them. Admin can manage all cities at one place adding, editing, deleting, activate or deactivate. According to cities admin can manage their area which includes adding, editing, deleting and activate or deactivate them. Admin can manage all pages at one place which includes adding, editing, deleting them and activate or deactivate them. Admin can manage all review list which includes deleting, activate or deactivate. Admin can manage all coupons at one place which includes adding, editing, deleting them and activate or deactivate them. Admin can view payment history like transaction id, order number, status, amount, payment type, date and time. Admin can delete them also. Admin can view the membership payment history like tansaction id, plan,amount, status, payment type, date and time. What does Our Multi Restaurant Food Ordering Script offer you ? The food ordering script that we have developed will serve as an attractive medium for customers to order food from the restaurants. It provides an option for delivery or pickup of food item both. Our online food ordering clone script enables users to get their favorite delicious food from recommended restaurants online at their doorstep without any hassle. Are you looking for single restaurant food ordering system? We have launched a hassle free hosted solution for food ordering at affordable price. This will allow the customer order from multiple restaurants by selecting city, area over the site. Customers will be able to select a Restaurant from the list and order. They can view the popular restaurants, according to the rating and once the order is delivered, they can rate the restaurant as well. Are you looking for a food ordering script like foodpanda clone, just eat clone, swiggy clone script, nearby clone script, talabat clone script or eat24hours clone? Then logicspice will be right choice for online food ordering and food delivery system. It gives you all the possibilities that a script of foodpanda clone or just eat clone, takeaway food order script etc have. You can give your customer options to pickup their food by themselves to provide them a more convenient solution. 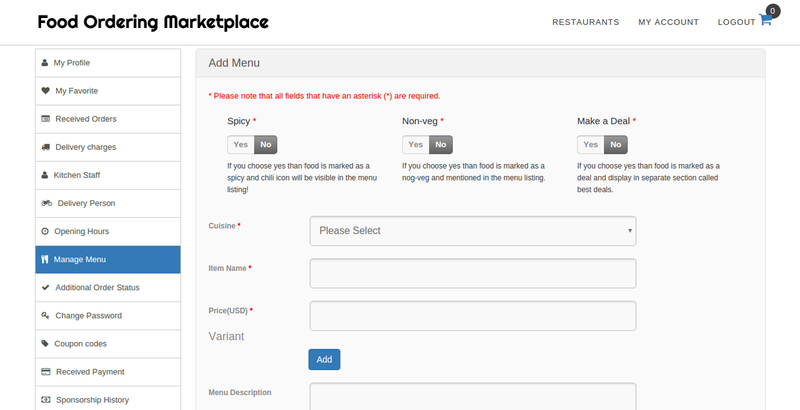 Logicspice have created a top food delivery script to provide customers the best experience. 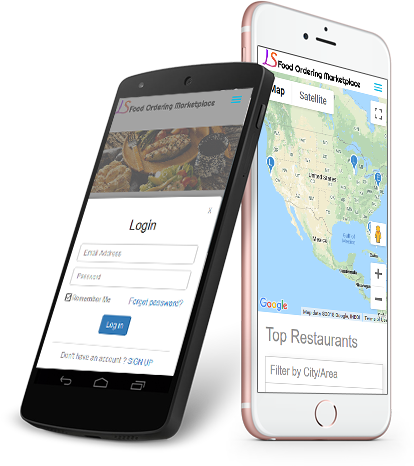 The interesting fact is that we have a food ordering mobile app for iphone and android app with latest features for food ordering and delivery business that boost your business in your budget. Our restaurant online ordering app effortlessly user friendly and intuitive is all what one wish for in a mobile app. "Perfect clone script to launch an online food startup. This script is embedded with awesome features. Thank you guys." "An extremely quick and helpful solution for online food business startup. Thanks to logicspice team for their timely support services." "I wanted to build a site like just eat & swiggy for online food delivery and I bought this food ordering script because it has many features similar to what I was expecting. It was very easy to install and works GREAT. Thank you logicspice." Can customer give a review/rating even if they have not ordered food from that restaurant? No. The customer can only review/rate the restaurant once his order has been delivered. Once I purchase the product, how many days will it take to go online? Time taken to implement your product depends on the level of customization and data migration. The time frame generally ranges from 7 business days to 30-40 days for complex implementations. Will there be any installation charges when I purchase the product? No. The installation of the product will be absolutely free of cost. Can customer cancel an order once they have placed it? Yes customer can cancel his order but only till the restaurant has not confirmed it. Once the order is confirmed, the customer cannot cancel it. Can customer track their order status on the website? Yes the customers can see if their order has been confirmed, canceled or delivered. Also, restaurants can add custom order status that they would like so that customers can be updated about each step of the order delivery. How will the customer be informed of changed order status? Customer will receive an email whenever the restaurant owner will change the order status on his end. Can the customer save their address once they have ordered from the website. Yes. Customers can save their delivery addresses on the website. Once they order their food for the first time, their address is saved. Ordering again they will be offered to select the previous address. The Customer can also manage their saved addresses and they can edit or delete old addresses. Restaurants can add their menus with details like cuisine, name, description, image and price. Restaurant can manage their menu. They can edit cuisine type, item name, price, description, item images.